Part of why we love running a small business in CT are the fantastic local people we get to work with and support. The people behind The Reach Foundation definitely fall into that category. 10% of the profits from Reach founders’ Mark and Wendy Wilson’s family owned Crazy Bruce businesses fund The Reach Foundation charities. We love it when our media goes global. As producers of special media projects since 2004 for Amphenol Corporation (headquartered in Wallingford, CT) we’ve been to London, Vienna, and now… Munich! Amphenol asked Miceli Productions HD to create an introductory media message for CEO Adam Norwitt’s private address to Amphenol clients during the 24th Electronika Germany trade fair in Munich (one of the largest trade fairs in the electronics industry). For this 2 minute media message we re-purposed material from our corporate documentary film created for Amphenol’s 75th Anniversary, using several motion control capture sequences and animation from that piece. We refreshed the script, updated the voice over, added new HD stock footage, and created new 3D logo animations (that were also used for digital signage – shout out to Kinemac, great 3D real time animation tool). Miceli Productions HD presented the workshop “Telling Client Stories Through Video” at the 3rd Annual Social Media Conference hosted by the CT Valley Chapter of the PRSA in New Britain, CT on October 20th 2010. Michael Miceli shared content creation insights, storytelling methods, tips on how to get the best DIY video, and important things to be aware of when using video online such as VSEO (video search engine optimization). We had a great time at the conference talking with public relations professionals about their video needs and the current trends of social media video. Questions from the participants ranged from “When should I use music under a voice-over?” to “Are news outlets more likely to accept self-produced B-roll footage in an environment of nationwide news staff downsizing?” (The answer is yes.) 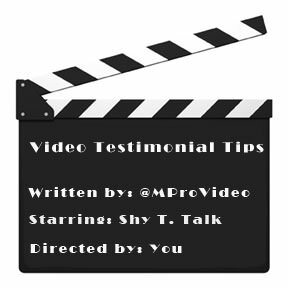 One question in particular spoke to the challenges of PR professionals who are often in the DIY video category, “How do you get a person to be relaxed in front of the camera for a video testimonial?” CLICK HERE for the follow-up on how to get a great video testimonial. ANSWER: It’s all in the directing. If you follow Miceli Productions HD 10 Tips on Capturing a Fab Video Testimonial you’ll be able to get even the most camera-shy people to give you their best in front of the camera. 1. Embody calm positive energy, earn the trust of your video testimonial subject, and exude confidence in the process. 2. Make sure you have a steady camera, quality audio and good front lighting on your subject’s face. 3. Don’t go it alone. Minimum 2 people. One behind the camera, one to actively listen and make eye contact with your subject. 4. Don’t assume the subject should always look directly into the camera. You can still get a very intimate message with a speaker looking at the interviewer seated close to the camera and at the same eye level as the camera. It’s very intimidating speaking directly into the lens. Make it easier for your subject by giving them another person to connect with. 6. Set the tone. Let your subject know if the testimonial is meant to feel formal, off-the-cuff or intimate. Tell them why they were selected to share their story – whether it was because of their passion, unique perspective or something else. People often wear many hats, help them focus on which one you want for the camera. 7. Give straightforward directions on what is being asked of the subject including whether or not you plan to capture one or several takes and if you would like them to repeat a question in their answer. 8. Communicate to your subject who the audience of the video will be. If helpful, have the subject imagine they are speaking to a specific person or community. This will help in their delivery, voice and focus. 9. Don’t be afraid to change DIRECTION, that is what a director is for. If something isn’t working and your subject is still nervous or unnatural, try changing who they are imagining the audience to be or giving some simple yes and no questions to answer in order to get the ball rolling. Change location if need be, sometimes something as simple as standing versus sitting can make a subject feel more comfortable. 10. Reward your subject at the end, thank them for their time and offer to notify them when/if the testimonial goes live. Seamlessly incorporating all these elements takes practice and planning. If you are working with a VIP and only have one shot (pun intended!) at getting a great testimonial on video, make sure to schedule a practice run for yourself.